Erin and I are moving to Los Alamos, New Mexico next week so I can take a postdoc at Los Alamos National Laboratory. Recruiting brochure published by LANL. Scanned by Colleen Bryant. It’s an interesting move in a lot of ways. First, the work itself promises to be very exciting. I think it might, and I hope it does, turn into a permanent career (something that I knew IBM never would). 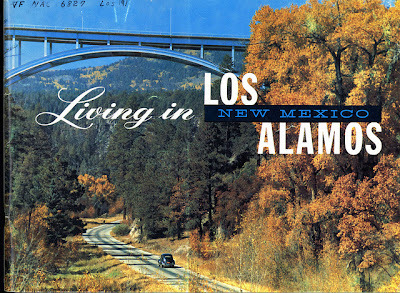 Second, as some of you know, Los Alamos is my hometown. I was born there and lived there until I left for college. I never in a million years expected to come back, even after I became a researcher – who goes back to their boring hometown these days? The lab is for physicists, not HCI people. And besides, I was a city person now. However, this spring, Erin and I visited Los Alamos and I gave a talk at the lab, because why not, and it might be good networking and/or practice. The talk went quite well. Afterwards, my dad, who also works at the lab, was riding home on the bus (yes, Los Alamos has a bus system now!) with someone who had also been at the talk, and this person asked: is he recruitable? Later my dad related this to me and asked if the lab was something that I would consider. Not really, I said. But over the next few weeks, Erin and I talked it over periodically, and the idea grew on us. It would be close to family. It was an institution whose legacy I was proud of, filled with smart and friendly people, and where I really could work on saving the world. I could park my bike outside without worrying about it. So, yes, we decided, I was in fact recruitable. My dad gave me some names, and I wrote a bunch of emails and talked to lots of people on the phone; this turned into an interview visit and that turned into an offer. And now the movers will be here in a week. Boys from the Los Alamos Ranch School on a pack trip. From Los Alamos Historical Society. I’m confident that we’ll be happy in Los Alamos. It will take a little more getting used to for Erin, since she doesn’t have 18 years of history there to build on (for example, I am told I’m not allowed to give directions according to what used to be there). And I think for a while things will be rather strange, since all my memories are through the eyes of a child. Net, however, it’s a very positive move and a tremendous opportunity for us. I’m extremely thankful that we are fortunate enough to be able to do it. *Assuming we know you. If not, accomplishing that is a suggested first step. Welcome back, Reid. We look forward to seeing you and Erin. Congratulations! Sounds like a great opportunity.